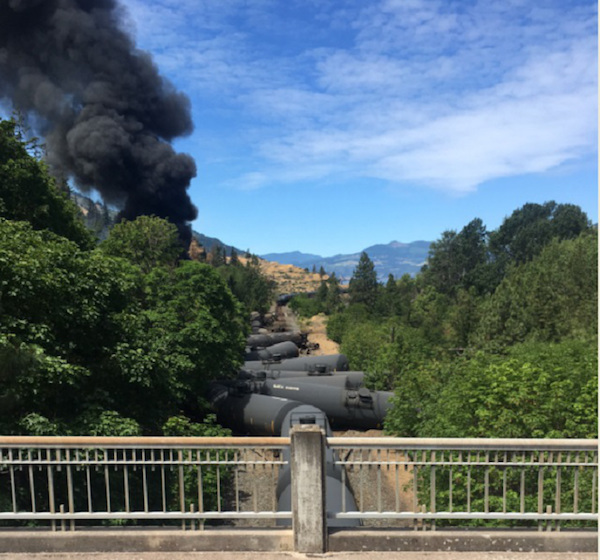 On June 3, a train carrying crude from the Bakken oil fields derailed outside Moiser, Ore., and caught fire. Under the headline “Mosier Really Dodged a Bullet,” the Oregonian reported the following day, “A half-mile east, and the inferno would’ve burned a few feet beneath a block of modular homes… . Another mile-and-a-half, and leaking tank cars would’ve landed on the bank of the Columbia River during peak spring Chinook salmon migration.” The list of tragic possibilities was endless. Only the Fates get credit for averting human tragedy, but the Mosier derailment has energized the already robust extraction resistance and climate justice movement in the Pacific Northwest—amplifying the call to stop fossil fuel industry plans from using the region as a transport corridor for fossil fuel commodities destined for Asia. In the weeks since the accident, regular people in small Washington towns like Hoquiam, Aberdeen and Mount Vernon have put aside political differences to express mutual outrage. Many, like their urban counterparts, are now insisting that elected officials say “No” to Bakken oil trains and other transport infrastructure that threaten their communities and the environment. Meanwhile, activists in the Pacific Northwest—known as Blockadia—are already well trained and battle tested following years of action camps, public engagement campaigns, protests and complex mobilizations like sHellNo! and Break Free PNW. 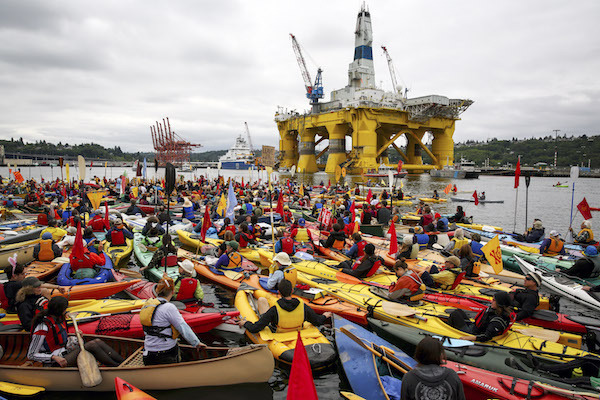 They’ve been fighting (and increasingly succeeding) against coal ports, oil terminals, refineries and pipelines—even tipping the balance on massive projects like Arctic drilling. Activist or not, many rational people realize that society's addiction to fossil fuel is killing us—polluting our land, water, and air while cooking our climate. But when it comes to the “modern” railroad industry, few understand the scope of the alliance between rail companies, and big coal and big oil. The transportation of soon-to-be outdated energy has been built into their business models—essentially creating a systemic dependence upon the continuous shipment of fossil fuel commodities. In other words, railroads are now tied to the boom and bust nature of the extractive economy. But this wasn’t always (and doesn’t need to be) the case. Already the most efficient form of ground transportation, rail has an unparalleled capacity to provide clean freight and passenger mobility. Unlike other forms of heavy, long-haul transportation such as ships, planes and semi-trailer trucks, rail can be electrified, and electricity is increasingly coming from clean sources such as sun and wind. Railroad companies began getting drafted into the fossil fuel economy when, under President Dwight Eisenhower, the U.S. government created the Interstate highway system. The creation of a publicly subsidized highway infrastructure was a major cause of high-value freight and passengers abandoning privately owned trains for trucks and cars. Coal, which needed to be shipped on trains year round, was the customer that saved the railroads. The industry’s dependence on coal grew. In 1970, the federal government bailed out struggling railroad companies by taking over and subsidizing the transport of people, creating Amtrak. Other railroad companies further scuttled service to communities, eliminating timely delivery of discretionary freight and stranding rural communities. Despite their common carrier obligations, the railroad business model in the United States became increasingly contingent on transporting heavy commodities, further favoring only the largest customers. This dependency on heavy commodities soon did away with regular schedules—today, freight trains depart when deemed full. As a result, rail employees, known as “rails,” are on call 24/7. This not only creates an uncertain work environment, it’s dangerous and unsustainable. The absence of regular work schedules fosters a fatigue-plagued, unsafe work environment that endangers workers, our communities and the environment. But being that the problem is systemic—inherent to the way railroads do business—it is not something that can be easily negotiated or regulated. Looking toward the future and the "post-binge withdrawl"
Until recently, railroads were an industry in denial of their precarious and fossil fuel dependent business model. They were riding high on the bulk shipments of coal and oil that many economists predicted would keep growing. That was not to be. Fossil fuel interests both here and abroad are increasingly on their heels, facing an uncertain future. The largest U.S. coal companies have declared bankruptcy while a global oil supply glut has caused many high-cost oil shale and tar sands operations to halt production. Over the first quarter of 2016, BNSF Railway (owned by Warren Buffett’s Berkshire Hathaway and, after the Department of Defense, the second largest consumer of diesel in the United States) laid off about 10 percent of its workforce due to declining coal and oil shipments. Many rail workers are now sitting at home on indefinite furlough while locomotive fleets sit idle in remote yards. These current troubles underscore how the boom-and-bust cycles of the fossil fuel economy batter the industry, workers and communities. The post-binge withdrawals have begun and the codependent railroad industry is also in a moment of crisis. What the above should make clear is that railroads and trains are not the problem. Rather, their dependence on an unsustainable, destructive business model is. Rail itself has unparalleled potential to play a pivotal role in making a just transition away from society’s dependence on fossil fuels. But it is time for the U.S. rail industry’s failing and toxic business model to cast aside its own fossil fuel habit and partner with public authorities to create the infrastructure our society needs and deserves. In 2003, I co-founded the Backbone Campaign—an organization striving to provide creative organizing strategies and artful tactical tools to bolster a progressive populism in the United States—and have been directing it ever since. Based in the Pacific Northwest, we remain confronted with the dilemma of both fighting fossil fuel transport by rail but wanting a vibrant railroad infrastructure. So, in 2013 we convened a national team of rail experts, economists, and public interest and rail labor advocates. The concerns and passions of those assembled ranged from climate disruption to the public health and safety threats caused by railroad freight, but all were motivated by a common belief that 21st century rail had great unfulfilled potential. The multi-pronged challenge was to develop a proposal that would both reduce reliance on fossil fuel transportation and make rail itself an engine to build an economy based on clean, renewable energy while at the same time providing new economic options for rail and fossil fuel infrastructure dependent workers. We call the result of these meetings Solutionary Rail. Solutionary Rail proposes overhead rail electrification, powered by renewable energy accomplished in conjunction with track modernization. This infrastructural investment will bring to the United States the reliable, electrified, higher-speed service now common on public railroads in Europe, Asia and elsewhere. Such service can draw significant portions of freight and passenger service lost to highways and aviation back to the tracks. Increased speeds and efficiency will allow the restoration of rail service that will revitalize rural communities along the tracks: Farmers will be able to ship their crops to market in a timely manner, public health problems caused by diesel exhaust will be greatly reduced and (eventually) coal dust will be eliminated in rural and urban communities alike. Meanwhile freeways, less burdened by the toll of long-haul trucking, will become safer. Higher speed freight and passenger rail capacity, with top speeds of 80mph/120mph respectively, will draw higher value, more profitable freight off of trucks and planes and back onto the rails. Over time, this new business model serving new customers will displace slow moving, low value coal or dangerous crude oil. Passengers and freight will not be chronically delayed behind bulk coal and oil trains. Clogging the tracks with will become less profitable and eventually a liability rather than the foundation of railroads’ current business model. The narrowly averted human and environmental tragedy in Mosier, the costly tragedy in Lac-Mégantic, and the constant endangerment of communities along the tracks will no longer be consider an acceptable risk and cost of doing business. Electrified rail can be an engine for moving the economy as a whole beyond reliance on fossil fuels. The electrification infrastructure above the tracks will pass through diverse weather systems and countless rural power cooperative, municipal and tribal utility service areas. Currently, utilities like Yakama Power are stifled in their ability to build additional generation capacity, because access to finance requires a customer for surplus electrons generated during peak production. The rail electrification infrastructure would serve as that customer and in so doing unlock stranded renewable energy resources all along rail corridors. Stacking efficient high-voltage transmission lines above the catenary lines for the trains will serve as superhighways for electrons, moving energy from remote wind and solar sources to metropolitan markets. Combined, these will unleash the massive untapped generation potential of distributed renewable energy. Accessing renewable energy generation across diverse geographies makes overall supply more predictable and reliable. This will in large part provide a solution to the variability of solar and wind sources, the most persistent impediment to transitioning off of fossil fuels. 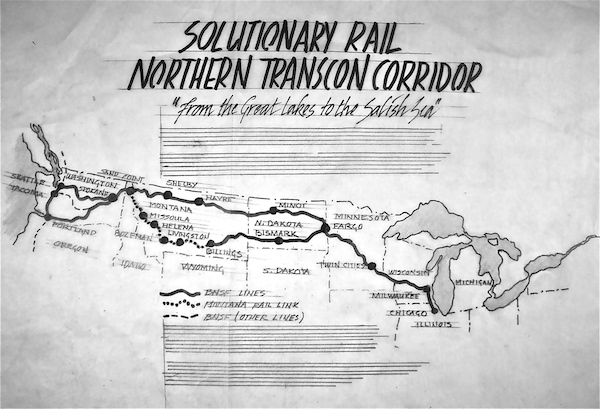 The Solutionary Rail team proposes jump-starting U.S. rail electrification with a demonstration from the Great Lakes to the Salish Sea, principally on BNSF’s Northern Transcon. The Northern Transcon and connecting branches, often referred to as the northern corridor, total around 4,400 track miles. Our priority would be to electrify the major 2,200-mile intermodal portion of this corridor, carrying containers between the Northwest and Midwest. This nationally important freight transport route, crosses diverse weather patterns and regional economies, offering the perfect opportunity to successfully demonstrate rail electrification's potential to deliver renewed vitality for U.S. railroads and the economy they serve. Indeed, this is a major infrastructural transformation proposal that will require a larger investment than any railroad company would do on its own. We therefore propose that states along the lines jointly create what we are calling a Steel Interstate Development Authority (SIDA). The SIDA would be a not-for-profit corporation operating under a board appointed by participating states. It would be chartered with the authority to raise funds for infrastructure investment on both publicly and privately owned rights-of-way. The SIDA would leverage the ability of public agencies to issue bonds and provide low-interest capital to invest in rail electrification in partnership with railroads and oversee funding and construction of electrification infrastructure. The electrification infrastructure and potentially some tracks would remain publicly owned. This would begin to restore our national infrastructure, our economy and society. It would mark a reversal in the trend of privatization that has robbed the public of the shared prosperity and accountability over recent decades. A Solutionary Rail demonstration along the Northern Transcon will require a broad alliance, including BNSF and its owner, Warren Buffett. Governors and legislators of states along the route will need to be pressed into leadership by a coalition of stakeholders ranging from railroad workers to municipal governments, agricultural, tribes, ports and major industries along the route. Rail electrification will provide phenomenal benefits to BNSF and other railroad companies. In return, some key public benefits will must be part of the bargain. One of those is a fair deal for rail labor. This is an integral element of the Solutionary Rail vision. Now is the time to advance projects and policies for a just transition for both rail and fossil fuel industry workers away from dependence on jobs in extreme extraction and transport and toward a sustainable, clean energy economy. As the United Steelworkers recently stated in their just transition resolution: “A clean energy job is any job that helps our nation achieve our goals of reducing greenhouse gas emissions and protecting our environment.” Perhaps no other industry is better positioned to play a more pivotal role in the just transition to clean, renewable energy as the railroads. All rail jobs can be clean energy jobs. Rail enthusiasts and rails recall the time in American history when thriving railroads served as the circulatory system for vibrant communities with strong local economies. Solutionary Rail celebrates the tradition from which these workers hail, identifies a public interest in their well-being and the sustainability of their vocation. Cities and towns on and near rail lines used to rely on rail service to access the world, to transport people and products to and from their regions. Much of the United States, in fact, grew on and around rail lines. Communities competed with one another to draw rail service, knowing their livelihoods depended on it. With Solutionary Rail, these days can return. Solutionary Rail charts a path forward to revitalize this infrastructural treasure. For farmers, utilities, tribes and rail communities large and small, electrified and modernized railroads can be a source of renewal and vitality. Together, we can build an unstoppable coalition to force dysfunctional elected leadership take unified action for a railroad infrastructure and transportation model that serves us all. Solutionary Rail helps the rail industry pivot from being part of the problem to become a fundamental source of economic, social and climate solutions in communities and a world that urgently need them. For more information about the Backbone Campaign, and to join the Washington State Labor Council in support of Solutionary Rail click here. To find out how to make a contribution to the people-powered grassroots Solutionary Rail campaign click here. Bill Moyer co-founded the Backbone Campaign in 2003 with artist friends on Vashon Island, WA. Responding to Bush administration policies, they applied lessons of the performing arts and their creativity to help invigorate a progressive movement for nonviolent social change. Bill has served as Backbone’s executive director since 2004. Through Backbone he and his team have designed and co-produced hundreds of creative actions; trained over a thousand artful activists in everything from grand strategy to creative tactics such as the giant flying banners, the use of stage lights to project messages, and Backbone’s recent hallmark innovation: kayaktivism. Bill humbly coordinates the talented Solutionary Rail team and is extremely proud of their upcoming book on the future of U.S. Railroads. He lives in the woods of Vashon with his wife and teenage daughter. Just like bonds for road financing, the bond interest income are tax free. That is part of uneven playing field tilting the scale toward road, even when rail freight is cheaper on a full cost basis ... roads are exempt from property tax and their bonds interest payments are exempt from income tax. Who backs the bonds? If not the government, then their interest is no different than any other private issuing. And if that's the case, then the railroads would take the risk of the debt if it was going to pay off. They are revenue bonds, not tax funded bonds. The reference to China was with respect to the claim that the only countries that are electrifying their rail corridors lack freight rail. This claim is patently false. I used China as an example because only one counterexample is required to disprove this kind of claim, and China is the country where I am living and working for three quarters of the year at present. What is "higher speed" rail? The trans-con freight that needs to move fast already does. That which doesn't, moves on 1 mile - 2 mile long manifests largely at 30 - 45 MPH. As for passenger ttraffic, the corridor is devoid of people and destinations. What few passengers are there, already move along at 79MPH on the Empire Builder. How much faster is "higher speed" rail? At what point does "higher speed" rail become High Speed Rail? CHina built it's HSR lines to get those passenge trains off their overcrowded freight lines. What is this "fast freight" ? What is the definition? This is fantasy in the rail industry. Either it's a visionary idea or it's delusional. WHo is backing the bonds? The context appears to be the government. If so that is a subsidy. Thanks Bruce and Steve from the Solutionary Rail technical team! You are conflating economically and commercially viable here. The reason that electrification hasn't been commercially viable is that we sell tax-free bonds to invest into road infrastructure and allow it to operated tax free, while we tax interest on private railway investment and then tax the infrastructure that is built. Leveling the playing field makes electrification commercially viable. So this is an opportunity to reduce petroleum imports and CO2 emissions without requiring either public capital or operating subsidies. If revenue bonds are sold to the public and then are repaid using access and user fees, that is not what most people would call "public money being used to build this". China has substantial freight rail. Rapid freight rail and rapid passenger rail are compatible. Certainly very high speed passenger rail is not compatible with freight rail other than very high speed light freight, but there is no fundamental incompatibility between freight operating at 90mph-110mph and passenger rail operating at 90mph-110mph. Right. The passenger speed will not be that much higher than the express freight speed which helps capacity. And the wheel loads for both train types will be similar. Speed and loading for passenger and express freight trains are both in a "sweet spot" that helps to minimize track degradation. Thanks Steve. And reminding folks that our proposal is for higher speed rail, as differentiated from high speed yes? While at Amtrak we met the challenge of accommodating heavy haul freight on some of the same track segments as high speed rail on the Northeast corridor. While not desirable it is doable, although not common practice around the world. For the case of Solutionary Rail the idea would be to add more tracks where possible to expand capacity and to keep the heavier, slower freight on tracks separate from the passenger and express freight trains as much as possible. BTW, if you would like some references I am more than happy to provide them. I'm an engineer, a problem solver and a lover of all human beings. I ask these questions because I care about the world. That said, you shouldn't need anyeone to provide you sources for basic information on passenger and freight data.. You after all are already talking about it. You have it. Face up to reality. In countries like France and Japan where passenger rail usage is high, freight movement on rail is anemic. 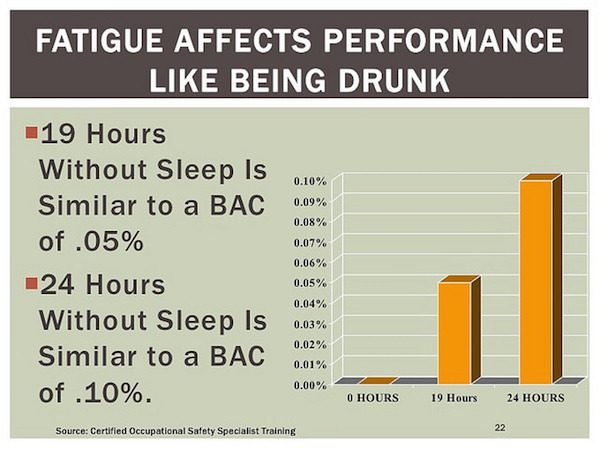 There's a strong correlation. And if you look at how things work, you'll see the CAUSATION. Maybe fter that, we can continue to talk about how countries like France and Japan show that large investments in high speed passenger rail only shift useage from low speed to high speed. They're spending hundreds of billions for a marginal shift. But,, that's another matter for another day. Let's concentrate on the basics first. Public money being used to build something is a subsidy. It is subsidizing that project. Why are you so desperate to re-invent the dictionary? The countries you reference lack freight rail. They also have the passenger usge that you aspire to have. The two are not compatible on the same rails. I'm sorry to ask questions that are not compatible with your world view. For readers: there is a campaign by fracked gas industry to convert trains to run on LNG (fracked gas). This is a stupid, inefficient false-solution. Booz Allen Hamilton used tax-payer money to do a study to discredit rail electrification. The Solutionary Rail technical team debunked their study and got it removed from the Federal Railroad Administration website last winter. No freight between Seattle and Chicago? Really? I-90? And - we are not proposing high speed rail, but higher speed rail. Do you think members of Railroad Workers United and other labor groups like the Washington State Labor Council would be supporting this if they thought we were making this up? I think those workers have a great better sense of the real world potential of this than you and me. That's actually almost entirely untrue. Yes, the trains are diesel-electric, but generating the electricity with internal combustion engine is far less efficient than transmitting those electrons from wind generation or solar. And BNSF is second only to the DoD in consumption of diesel. Actual electric locomotives both accelerate and decelerate more quickly for curves and stops which adds additional capacity. They ditched overhead lines for many reasons but not that they were inefficient. Railroads were in collapse and consolidation was the trend. The management of the Milwaukee was a house divided between investment and closing gaps in electrification and those who wanted to sell to other railroads running diesels. "Gaining sufficient investment to properly maintain and upgrade the electrified lines remained the primary challenge facing Milwaukee electrification through most of its history. This underscores a crucial insight at the center of the Solutionary Rail proposal. Electrification provides superior operating performance, but high upfront investment costs pose an obstacle for privately owned railroads that must carry private borrower interest rates. Solutionary Rail seeks to overcome this barrier through new partnerships between the public, railroads and other stakeholders focused on securing the benefits of electrification for railroads and society in general. The proposal is detailed in a later chapter." Whether the money is used to build overhead lines that are owned by some not for profit entity or by a for profit entity, it's still a subsidy. Public dollars would be used to build this. Railroads are already electrified. They ditched the overhead lines because they were less efficient than just generating it on the spot as needed, when needed. "Such service can draw significant portions of freight and passenger service lost to highways and aviation back to the tracks. " Where high speed passenger rail exists, freight is nearly absent. Please direct us to details as to how you believe that will not be the case here. Good discussion, all of which shows why the forward thinking of the Backbone Campaign is in the best tradition of what once was considered great in the USA--American Know How and American Can-Do. We use to be a nation that led. We now don't even follow the best of what the world offers anymore, let alone lead. It's ocyen easy to quibble with "big" thinking, but so much better to creatively add ideas which make the big possible. Thanks Bill Moyer for all your dedicated and forward thinking work. Electrification pencils out around the world and it can pencil out here. We go into detail in our upcoming book about the US history and abandonment of electrification - which was NOT because it wasn't viable. We address the unique US problems and have created this proposal to overcome those obstacles. Electrification is in some ways inevitable exactly because in the long run, it is far more viable, it is immediately more efficient, and its inherent benefits automatically increase capacity. We are not proposing a public subsidy but a public partnership and investment in publicly owned infrastructure that will pay off financially and socially. It is a far better investment than actual public spending on freeways that are less efficient and amplify deferred maintenance. If electrification wasn't economically viable in the past, it certainly won't be economically viable now, with less rail traffic. You can still electrify now based on direct or indirect government subsidy. But I suspect there are more valuable things to subsidize. 1) Rail traffic is declining because of decreased use of coal and oil. Now in what universe do companies invest MORE in an asset that has become LESS valuable than before? Please do check out the proposal. We are addressing this important tax issue in a completely different manner. We are NOT enticing railroad companies to build infrastructure with tax breaks. BECAUSE the improvements will be built and owned by the PUBLIC entity and remain owned by it, the property taxes on improvements will NOT increase. Hi guys, the caption has been changed to reflect John's (much appreciated) correction. Nice to see a discussion taking place on this one. We need you on the team. One further clarification, the trackage operated by Montana Rail Link is still owned by BNSF, MRL operates the line under a 50-year lease. I have not studied this proposal in detail but I note one area that will require attention that is completely overlooked, or at least not addressed. That is the issue of taxation with respect to the real estate and equipment owned and operated by railroads. The European Railway Systems that have engaged in large scale electrification programs are either state owned or operate under a different taxation structure than their American Counterparts. Any successful implementation of a large scale infrastructure improvement and electrification program is going to require a reduction in taxes on the areas of railroad business operations directly affected by this proposal. This is going to require a large number of taxing authorities to make serious concessions that they will be unwilling to make. It will require not just the railroads but many governmental agencies to restructure their business models, something that will be politically unpopular in many if not all areas. Historically taxation issues have had a major effect on railroad operations, an effect that is not well understood or even appreciated by the general public. In many cases, the taxation issue has been the deciding factor in the curtailment and abandonment of rail services for many decades. Yes, thank you for that clarification. Another part of the route is owned by Montana Link. I did not mean to imply that the entire route was BNSF. I will clarify that in the caption. Do you think the essay needs any further clarification? The rail line you show from the Twin Cities to Chicago via Milwaukee is owned by Canadian Pacific' US subsidiary Soo Line Railroad. BNSF's line to Chicago parallels the Soo Line as far as the Wisconsin border then follows the Mississippi River into Illinois before turning east to Chicago.